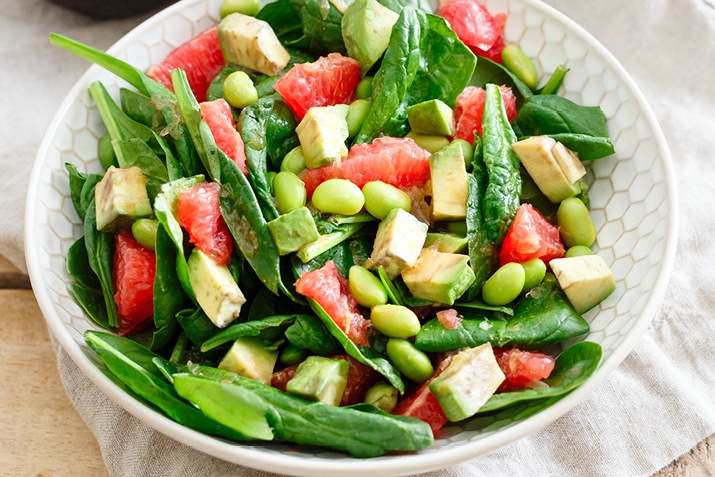 Break out of your salad rut and make this tangy treat, with sparkling grapefruit sections, crunchy edamame and creamy avocado. In a cup or small jar, combine the lime juice, sesame oil, soy sauce and fresh ginger. Whisk or shake to mix. Spread the spinach leaves on two dinner plates, then top with grapefruit sections and sprinkle with edamame. Halve the avocado, remove the pit, and use a paring knife to slice the flesh in the shell. Use a spoon to scoop the slices out and place them on the salads. This salad is filling enough for a light vegetarian meal, or serve as a side for an Asian main course.